New Eight Hour® Cream Skin Protectant Fragrance Free offers all the amazing benefits of the original “miracle cream.” When it comes to skincare, this apricot-colored balm helps relieve chapped, cracked dry skin, soothes and comforts redness, minor scrapes and abrasions. When it comes to beauty, it’s the ultimate multi-tasker from grooming brows to glossing lips. 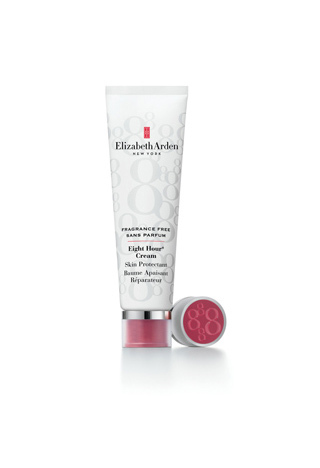 Eight Hour® Cream Skin Protectant is one of the most famous, popular and sought-after products in the world today. Celebrities, makeup artists, models and beauty experts all agree – Eight Hour® Cream is a beauty “must-have.” Winner of over 40 global beauty awards and found in all the hottest “it” bags, Eight Hour® Cream Skin Protectant is a Hollywood icon, a socialite secret and an international cult favorite. Selected Edgars, Red Square, Foschini, Truworths and Woolworths Elizabeth Arden counters nationwide. 1. Skin Saver – Protect skin from drying wind, central heating and air-conditioning. This skincare multi-tasker soothes, restores, calms and helps relieve minor skin irritations including roughness, redness, chapped, cracked or dry skin. 2. After-sun Soother – With its legendary soothing and moisturizing benefits, it’s the ideal after-sun treatment to relieve minor sunburn and calm dry, irritated sun-exposed skin. 3. Shine Factor – Found in top makeup artists’ kits worldwide, this all-in-one beauty tool adds shine to eyelids, cheeks, lips and legs. 4. Eye Opener – All it takes is a dab to smooth eyebrows and create a perfectly defined arch that will stay in place all day. 5. Cuticle Conditioner – Soften rough, dry cuticles to keep them smooth, supple and beautifully manicured. 6. Treat for Feet – Smooth rough heels and soften soles for barefoot beauty in every season. 7. Flight Tool – Flying can leave skin looking and feeling dry and uncomfortable. Take along this intensive hydrator to boost skin’s in-flight moisture level wherever you go. 8. Leg Wear – Calm irritation, reduce redness after shaving or waxing to leave legs super smooth and silky soft.